The Infomaniak Guest Manager includes all the tools you need to create and manage online invitations. It is easy to use and adapts to all events (team-building trips, opening ceremonies, previews, birthdays, dinners, weddings, etc.). Choose a template, customize your theme, and decide on the practical information for your event. Edit the text, import your contacts, and create as many guest groups as you want. Track in real time who is coming to your event, easily remind your guests and contact them. Save time with ready-to-use templates. Choose a template, add your personal touch to existing texts and send out your invitations. Our tool automatically takes care of displaying the location and information about your event. It's fast and easy. Create multiple categories of guests with different conditions. 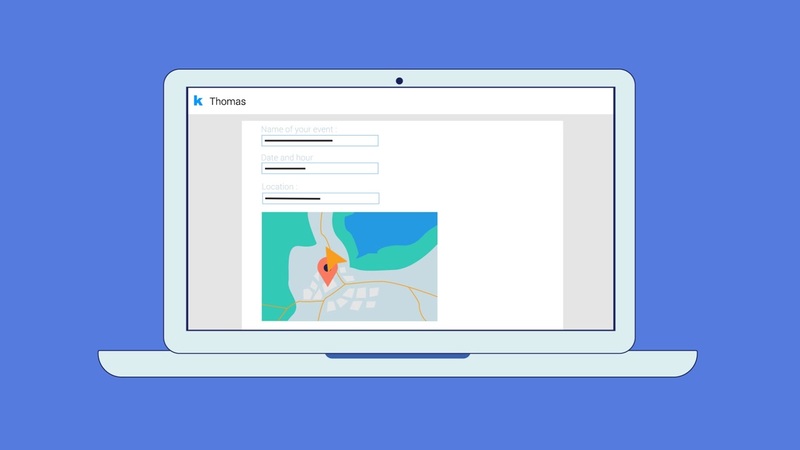 This way, you will have an overview of your guests, all while being able to contact, track in real time, and establish registration deadlines for each of your groups. Make your guests happy and give them the chance to come with one or more people of their choice. You even have the option of adjusting this setting individually for your important guests. Collect the information that you want when registering your guests. For example, you can use this feature to find out their dietary restrictions or their favourite activities. Check at a glance how many guests in total and by group will be participating in your event. You can also see the number of plus-ones and people who declined your invitation. Establish different registration deadlines based on your groups. The invitation tool will handle reminding your guests automatically, and you will receive reports by email to verify the success of your event. Contact your guests at any time by choosing who should receive your message: confirmed guests, those who haven't yet responded, or people who have declined your invitation. This way, it's easy to get back in contact with your guests after an event. Easily confirm guests in attendance using the QR code on their ticket. Print out a list to manually confirm the guests in attendance at your event. Rent our iPods and our wifi terminals to manage your event on-site. Send your invitations free of charge using our guest manager and focus on what's important: organising an unforgettable event. Thanks to the free included credits, you can test all of the features of the tool with no commitment and no limit. Simplify organising your events by using an invitation manager. Easily organise your invitations for a project launch! Need an invitation management service to organize a preview or private screening? Make it easier to organise your dinners with an invitation tool to manage your guests! Looking for a solution to manage birthday guests? Need an effective solution for managing guests for a seminar or free conference? Need a software for managing your wedding guests? Looking for a free invitation tool for organising your baby shower? No credit card required. No subscription required. Whether you are a professional or an individual, our prices are extremely advantageous and do not require you to take out a subscription. 1 guest = 1 credit. Credits purchased have no expiration date. The data from your contacts and your emails are hosted in Switzerland in Infomaniak datacenters and are not shared with third parties. The Infomaniak invitation software is constantly evolving based on the needs of our clients. It can be adapted to all types of events and does not require any special knowledge. Can I test the guest manager without buying credits? Yes. You can send 100 invitations free of charge without having to enter a credit card number. That way, you can test the guest manager with no commitment and no restrictions. Is it possible to take out a subscription to send out a large number of invitations? Pricing is not restrictive and is based on a prepaid credit system: 1 credit corresponds to 1 invitation sent, and credits have no expiration date. If you plan to send out a large volume of invitations, feel free to contact our support. Is it possible to sell tickets using this invitation software? To sell tickets online, we recommend using the Infomaniak box office. It's enabled in just a few clicks and lets you manage every aspect of your events (volunteers and staff, media, guest lists, badges, bracelets, etc.). Flexible and very competitive, this solution can be embedded very easily on your site or your applications using our API. Feel free to contact us to find out more and test out our online box office free of charge. Does this invitation tool let you manage multiple events? Yes, the tool was designed to handle multiple events. Managing guest lists is centralised, which enables you to use them for different events if necessary. How can I import the contacts for my invitations into the invitation software? It's easy to import your contacts using a file in CSV format. If necessary, you can also manually add contacts, and eventually the tool will let you automatically import contacts from the WorkSpace or Gmail. Feel free to contact our support by email, chat, or phone if you have questions or suggestions. We are here for you 7 days a week. Need an online box office to sell tickets?